Talk about a fun Easter breakfast! 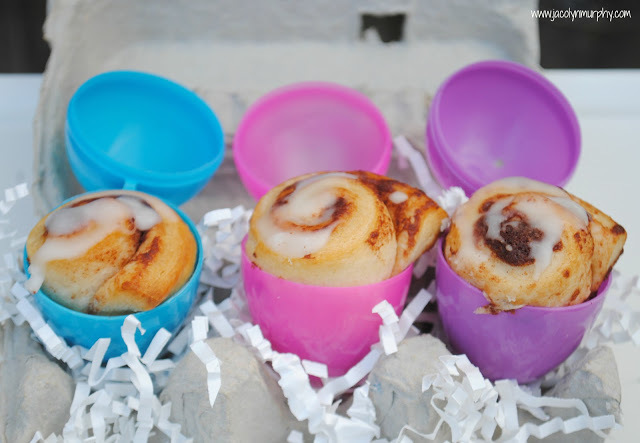 Yummy cinnamon rolls tucked inside colorful plastic Easter eggs. Not only are these Easter Egg cinnamon rolls a fun treat, they will look cute on the table. Put them in a carton and they would be a fun neighbor gift too! You can check out how to make Easter egg cinnamon rolls over at Jack o' lyn Murphy. How awesome are these little treats! No one would expect a cinnamon role in an Easter Egg! I love it.